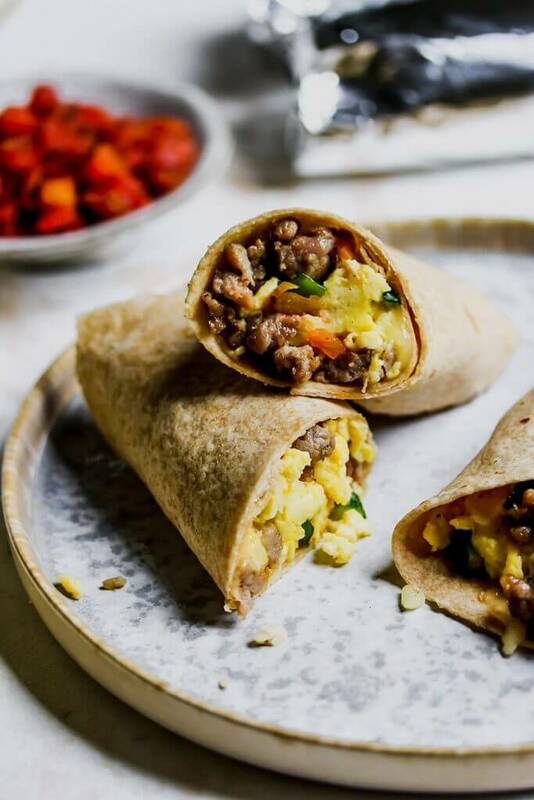 Start the day with a Grab-and-Go Freezer Breakfast Burritos as you head out the door. Mornings can be hectic but with a little bit of prep work they don’t have to be. I’ve found that having simple breakfast meals in the freezer ensures we have a balanced and delicious morning meal that is ready to eat in minutes. This helps to keep our busy mornings running smoothly. 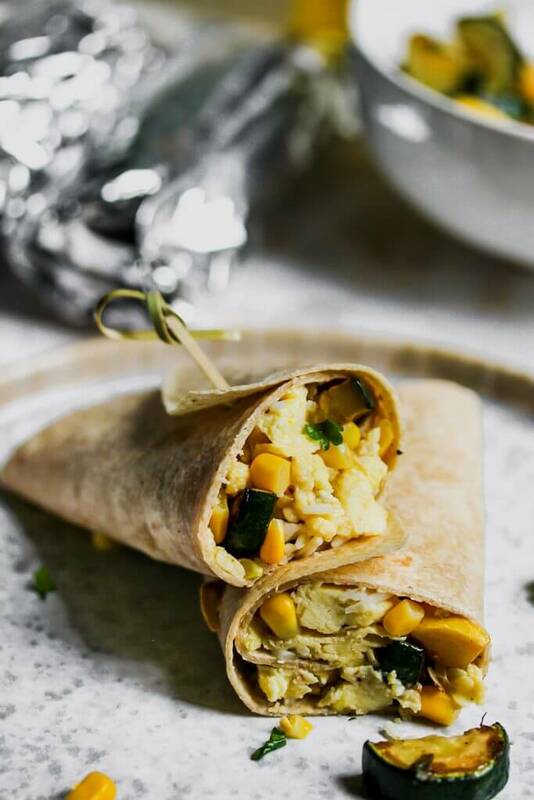 These grab-and-go burritos are freezer-friendly making them an easy and delicious way to start the day. 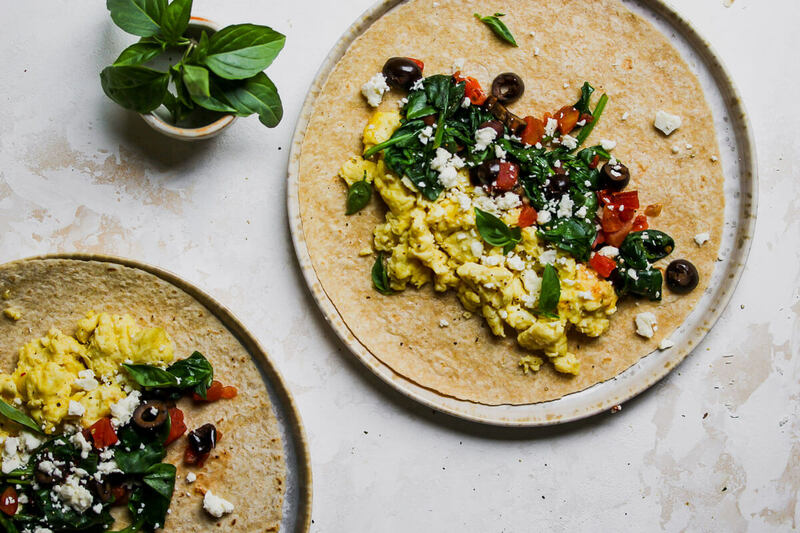 Customize your breakfast burritos by using large flour tortillas, scrambled eggs and some of these ingredient combinations. I’ve found that when assembly burritos that you know you are going to freeze, allow the ingredients to cool for at least 10 minutes. Once everything is room temperature or cooler, assemble the burritos. Make cheese the first layer against the tortillas so that it can act like a protective barrier from the moisture of the eggs and vegetables. Layer with dryer ingredients and finishing with the scrambled. Once you add the filling and fold the burritos, wrap individually in foil. 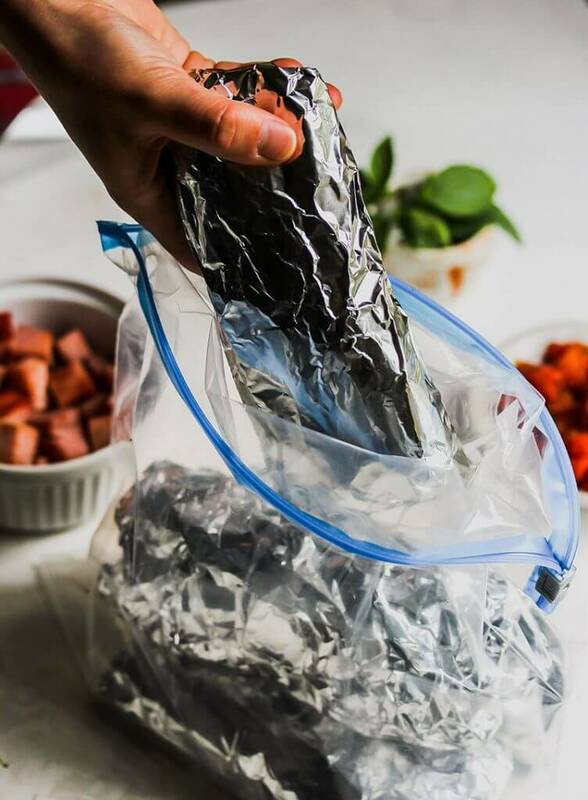 Transfer wrapped burritos to a baking sheet and allow to freeze in a single layer. Once the burritos are completely frozen, store in an airtight plastic bag for up to 3 months. 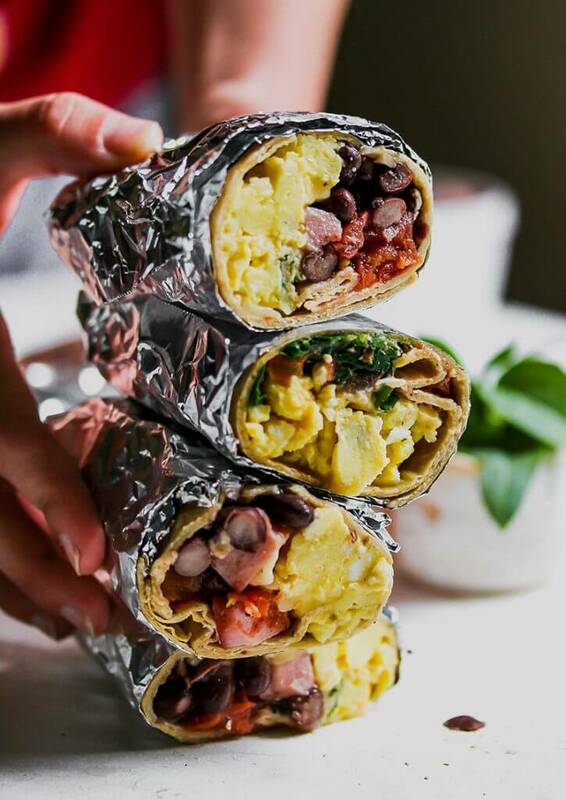 If you’re able to plan ahead, transfer your frozen breakfast burritos to the fridge the night before. This will allow them to slowly defrost resulting in a speedier cook time in the morning. In this case, microwave burritos (without the foil wrap) for 30 seconds on each side or until they’re warmed through. Bake at 350F for 10 minutes or until heated through. If you’re reheating from the frozen state, microwave on HIGH for 1 to 2 minutes or bake at 350F for 15 minutes or until heated through. 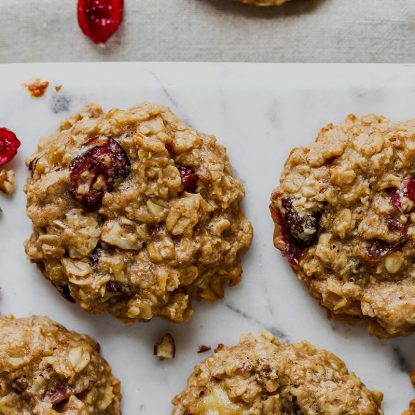 I’ve rounded up some of my favorites quick breakfast ideas for busy mornings. Whether you prefer a sweet or savory breakfast, I’ve got something for you! 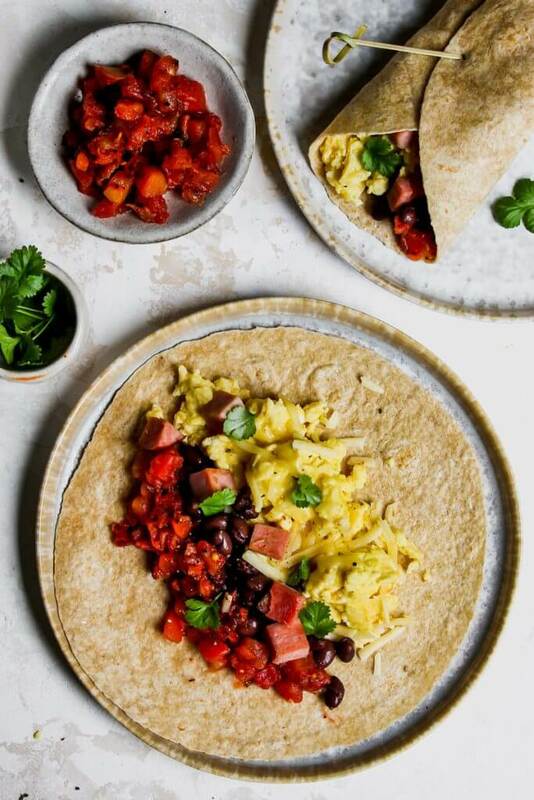 My favorites for fall…Chunky Chocolate Chip Pecan Breakfast Cookies, Pumpkin Pie Smoothie Bowl and, of course, these breakfast burritos Mediterranean style!